If youre a graphic designer, then this post will be (or at least should be!) cold coffee for you. If however you are one of the million happy-snappers out there, who just open the odd photo in photoshop to print (or play around), you probably never thought about colour modes, profiles, bit depth or colour gamuts. Am I right? Colour is simply a specific wave length of light reflected from a surface. The question is: Reflected from what? A vibrating crystal of your brand-spanking-new LCD display, or a paper print, lustre or glossy? A canvas maybe, or a photo book? Have you ever wondered why the brilliant colours on the back of your camera look somewhere between slightly to dramatically different to the colours on your computer screen, and again different from the best quality print you can produce? Nope, they all look the same well, you must be one of the lucky few who run a colour-managed workflow (if you know it, or not). Every device uses different processes to reproduce colours. The easiest ones to explain are pure black and white: Your screen does nothing at all to show black, your printer however has to work hard. White however means do nothing for your printer, but most work for your computer screen. So we not only deal with completely different processes to produce the same colours, but in most cases also different basic colours. Your screen uses RGB, your printer CMYK. Your screen uses three colours (RGB / Red, Green, Blue) to simulate millions of colours. Being an additive and illuminated process, most screens can display a larger range of colours than most printers. Printers use 4 colours (CMYK / Cyan, Magenta, Yellow, Black) to mix colours in a subtractive process. So what? My prints look good! You most probably use a printer driver which does a good job translating your RGB colours to your printers CMYK. Depending on the paper and printer driver settings, you’ll end up with a wide range of results from good to dreadful. To take the guesswork out of the equation, clever people use colour profiles, retouch in a wide colour gamut, understand the benefits of 16-bit and convert images for web & email to the right format. A colour profile is a detailed description of the technical capabilities of a device. You should use a colour profile for your screen (hardware calibrated), your printer AND a print-and-media specific profile for the paper you are printing on. Colour gamut defines the amount of colours addressable and their position within the specific colour space. sRGB has a limited amount of addressable colours, while a wider colour gamut like Adobe RGB or ProPhoto can work with more colours. Note: Working in a wide colour gamut does not mean, that your printer will be able to reproduce these colours, but it allows you to create more subtle changes without introducing artefacts during editing. Depending on your printer, the colours have to be converted/placed within a colour gamut that your printer can actually service. Step 1: Calibrate your screens! To guarantee that you get in print what you see on screen, calibrate your monitors with a hardware device like a Datacolor Spyder, Xrite ColorMunki or a Pantone i1Photo Pro. All of these products do more or less the same, they create a measured colour profile for your specific screen and work environment. Different colour modes offer different amounts of addressable colours. If you retouch your images, use a wide colour gamut such as ProPhoto. This will give you more workable tones than if youd work in sRGB. For most retouching jobs, 8 bit will work ok, however if you plan to do more dramatic changes, such as colour shifts, youd get less colour artefacts if you retouch your images in 16-bit. Better still than open a jpg and converting to 16-bit would be to shoot your images in RAW and open them in 16-bit and ProPhoto. Use layers to make your changes, especially if you use colour adjustments and curves. 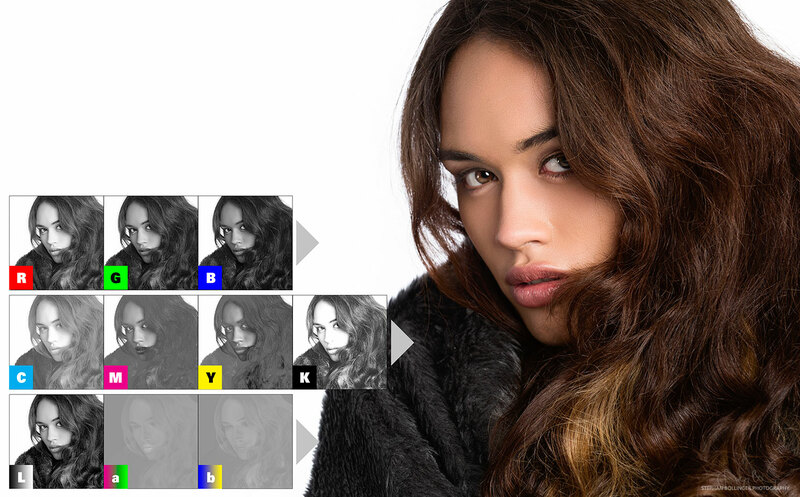 Instead of applying such changes directly to your image, use adjustment layers. This will allow you to tweak your image quickly if your print doesn’t meet your expectations (or you simply change your mind down the track). If you edit your images in 16-bit Adobe RGB or ProPhoto, remember to down-convert your image before sending it to clients or friends. They will most probably not have a colour-managed system and your best bet is to always send them 8-bit jpg files in sRGB. The same applies for any use online, on your website or sites like facebook, convert to sRGB. As your printer will use CMYK to reproduce your colours, use the latest drivers for your printer. Printer manufacturers are constantly improving their drivers. Download the correct (printer-specific) colour profile for the paper you use and make sure, you set both printer + paper settings accordingly (in photoshop as well as in your printer driver). SO, AND WHAT IS LAB? Lab (as in L, a, b, not Lab) is the most powerful and most complex colour mode, the ber-gamut. While RGB and CMYK work on a base of 3 and 4 colour channels, Lab uses a L (Lightness) channel and 2 colour channels (a+b). This allows for independent adjustment of colours and luminosity. The way the a and b colour channels work creates a super wide colour gamut, and allows for colour manipulation outside of the reproducible spectrum of printers and most screens. Need a 100% white with 100% red? No chance in RGB or CMYK, but no problems in Lab.